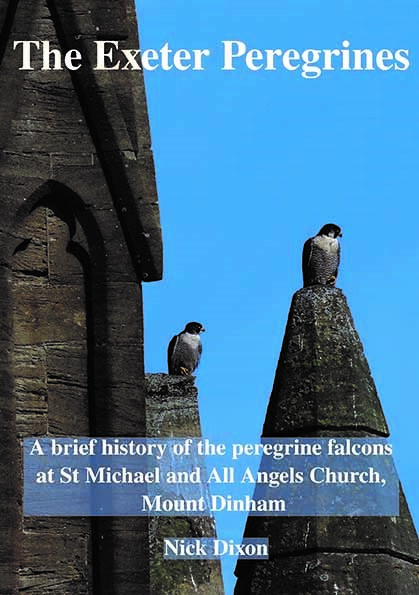 St. Michael and All Angels in Exeter was the first church in the UK to have breeding peregrines, following the species recovery from the population crash in the 1960's. The Exeter peregrines have bred every year since 1997, with 55 young fledging over the past twenty years. During this period, they have been closely watched and monitored, resulting in a fascinating study of Devon's only pair of urban nesting peregrines. Changes of adult birds, annual breeding, egg laying and hatching, juvenile fledging success and development, prey selection, behaviour and hunting, plus interaction with other species in the vicinity have all been recorded by observers, and via the internet. 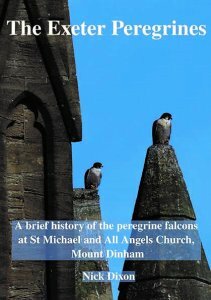 This 24 page A5 booklet (7,500 words and 17 colour photographs) reveals the story of the Exeter peregrines, from first occupation in 1988, and through twenty years of breeding from 1997 to date. All the proceeds from the sale of this booklet will go directly towards the upgrading of the nest camera from analogue to HD resolution, prior to the 2017 breeding season, and to support the costs of live internet streaming. If you would like to purchase with alternative means, please contact me via my website.